A State of Mind: Linking up? There are some topics that, one would have thought, NSW Labor would be wise to avoid. Abscence makes the heart grow fonder, and there can be no doubt that the voters will soon become more cynical about the Coalition, and less more favourably disposed towards O'Farrell. How long it takes for the public to attain the required level of cynicism will depend on the topic. Wages and conditions for public servants will alwys be a hot topic - after all, the Coalition is a government drawn from the right, and they are practically expected to hurt the public service. And so they have. On other issues, however, the left should be slower to throw stones. And there is no issue that Labor should be quicker to retreat from than Infrastructure spending. The Labor government achieved very little in the way of infratstructure during its time in government. True, a number of large road projects were built - but they were funded by private companies, resulting in heavy tolls - and not tolls carefully calibrated to encourage commuters onto puiblic transport, but rather heavy tolls calibrated to deliver the maximum return to the private companies. When it comes to public transport, the Labor can point only to the Airport Link and the Chatswood-Epping Rail-link. The Airport link is not nearly as impressive as one might suppose. It was sorely needed (indeed, the only surprise is that it wasn't built before) - but it was funded by the private the sector, meaning that the cost to use it is so high that, even from outer parts of Sydney, it is often cheaper to use a cab. The Chatswood-Epping Rail Link is great - until you consider that it was meant to be the Parramatta-Chatswood Rail-Link, until budget blow-outs and general incompetence meant that it was shortened and still, incredibly, managed to come in well over budget. So Labor has no right to throw any stones. During the last election, a commitment from Labor magically appeared - NSW would spend $500 million and the Federal Government would contribute $2 billion to link Epping to Parramatta. This was an obscenely cynical promise. By the point that the promise was made, Labor knew that they had no chance of winning. They also knew that O'Farrell has committed to the North-West Rail-Link - an extremely expensive but equally necessary project. Pennies would need to be pinched. 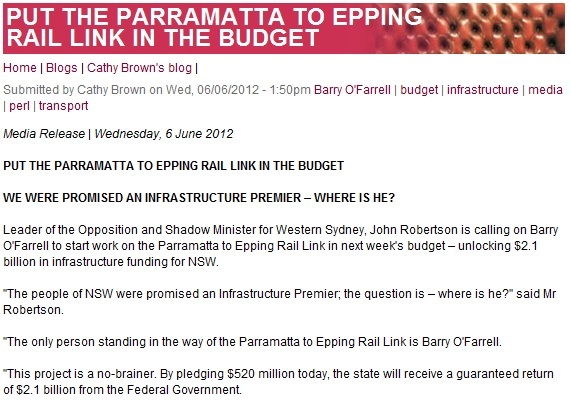 Moreover, the Parramatta Epping Link was now Labor's idea - and if O'Farrell decided to fund it then it would be "Labor's idea" - and all credit for the plan would evapourate. What Labor's promise really meant was that the Parramatta link would never be built - or, at the very least, it would slip well down the priority list. Like I said, cynical. This is what press releases like this from Labor are meant to achieve. It is meant to damage O'Farrell for not doing something that Labor would relentlessly hammer him for doing. Does it work? Probably. But far less than it would if Labor actually had a good record of building the infrastrusture that the press release talks about. The problem is that of course Labor has no such record - and the public remembers that Labor squibbed on building that link in the first place. It seems pretty unlikely that an attack on the Coalition for not building is going to do anything other than remind the public about Labor's (many) failings. Penny Sharpe (who I generally like and respect) might be better advised to find a credible basis to attack O'Farrell. Because this infrastructure line sure ain't much chop. I agree in regards to Labors inability to deliver public transport. However I think both parties are wasting time and money with both the NWRL and the PERL. The best bang for NSW buck would be a second harbour crossing, with a new CBD relief line between Chatswood and Redfern. This would free up space in the whole system, and massively so. Frankly the areas earmarked for the NWRL and the PERL are not vital to the city rail system or the wider NSW economy. Increasing capacity on the whole system would be both. All Labor and the Liberals care about is narrow election cycles and marginal seats.